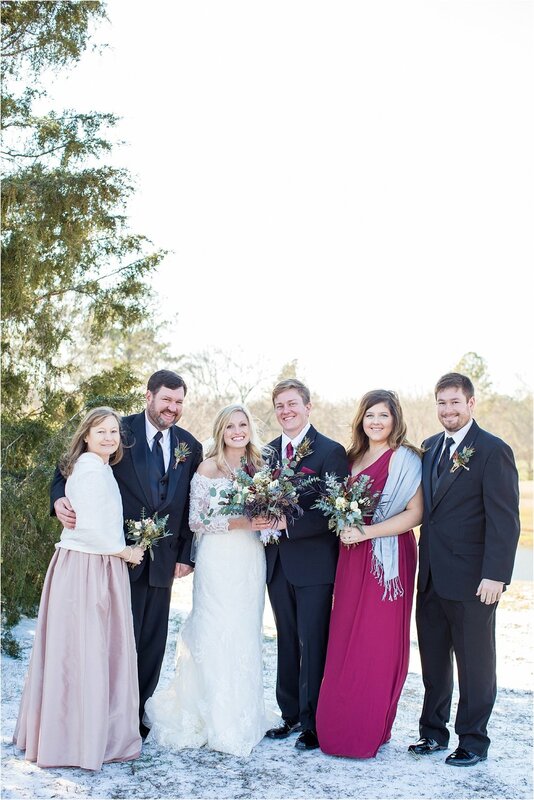 An Elegant Winter Wedding at Sweet Meadow Farms in Tallapoosa, Georgia. 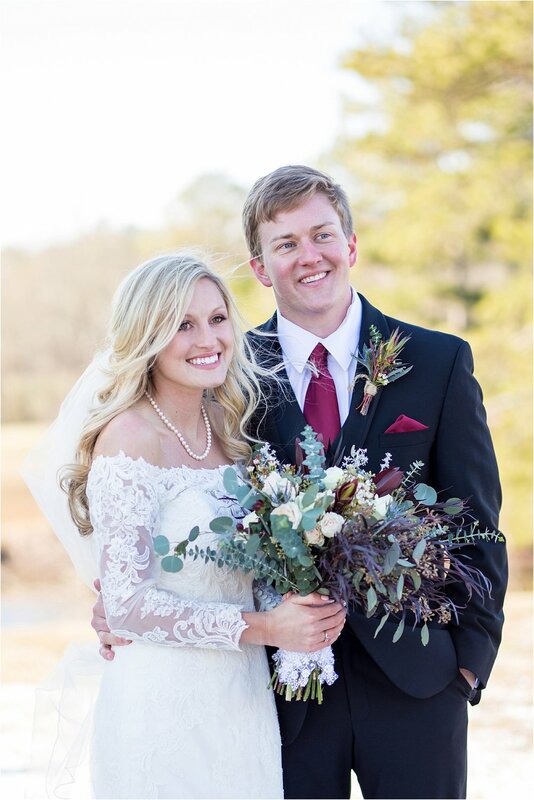 Sydney & Taylor's wedding at Sweet Meadow Farms at Beech Creek in Tallapoosa, GA yesterday was a wedding I won't forget. I met Sydney my Freshman year of college at the University of North Georgia. We were both in the same intro group and about 6 months later, we went through recruitment together with a few of our close friends. Little did we know we would sit side by side during pref night, then pledge Phi Mu together. Sydney also met Taylor our freshman year. Taylor was the coach of the BCM intramural flag football team, and Sydney is a heck of an athlete. Taylor pursued Sydney, much like Christ pursues us. After coming home from a weekend celebrating a bachelorette, Sydney and all her roommates went on a "group hike." Sydney said she figured the proposal would be coming soon, but was not expecting it this day. She thought they were all just going on a fun roommate hike! So they all hiked Preachers Rock (one of the BEST hiking spots in Dahlonega, GA- if you haven't gone, you SO need to) and when they got to the top, Taylor got on one knee and her friends were able to video the proposal and snag some photos! 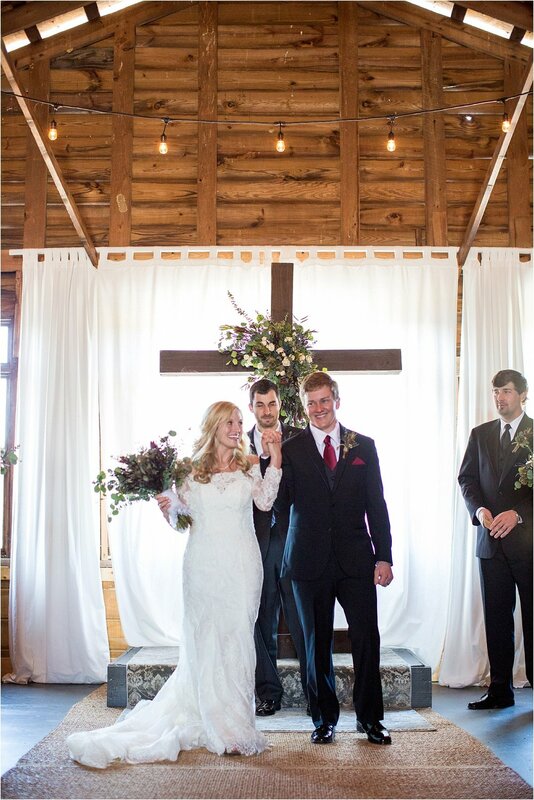 And so here we are, about 4 years later, celebrating the sweet marriage of one of the most Christ-centered couples. A snow (but really ice lol) storm was headed our way for the weekend, but that wasn't about to stop us. Friday night when we got to the hotel, I think we all knew we'd have to be flexible and go with the flow. I hadn't ever seen this venue until the day of. I had looked up pictures online and couldn't wait to see if for myself. When we drove up, I was in complete awe. 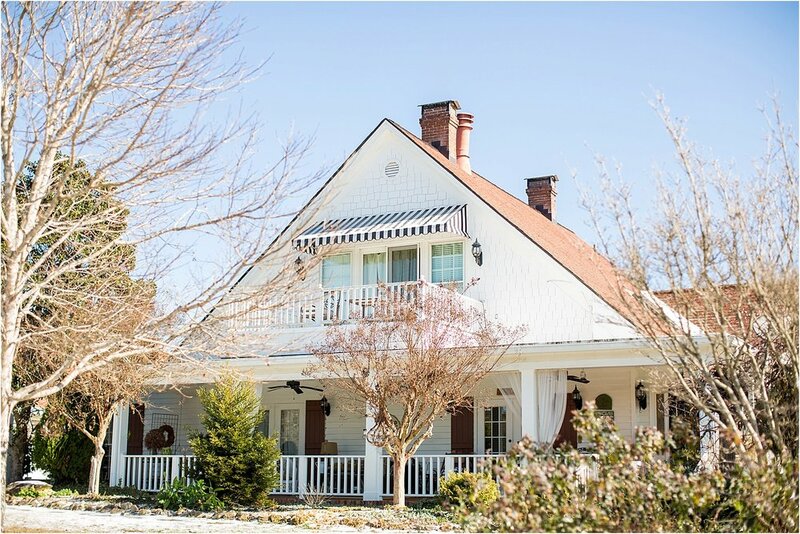 Sweet Meadow Farms at Beech Creek is AMAZING y'all. I can't wait to share these photos with you, because I promise my words won't do them justice. Sydney & Taylor, thank you so much for allowing me to play a small role in your big day. I enjoyed working with the two of you and ENJOY MEXICO!! I've said it once, and i'll say it again. Sydney gives Kate Middleton a run for her money in the bride department. 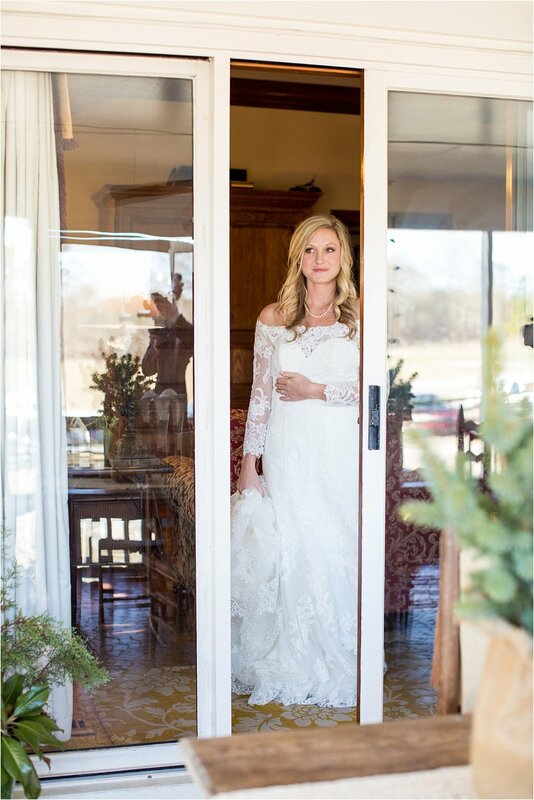 When her mom helped her get into her dress, it was like a rush of peace was laid upon Sydney. She had a minute to herself to gather her thoughts and soak up this moment. 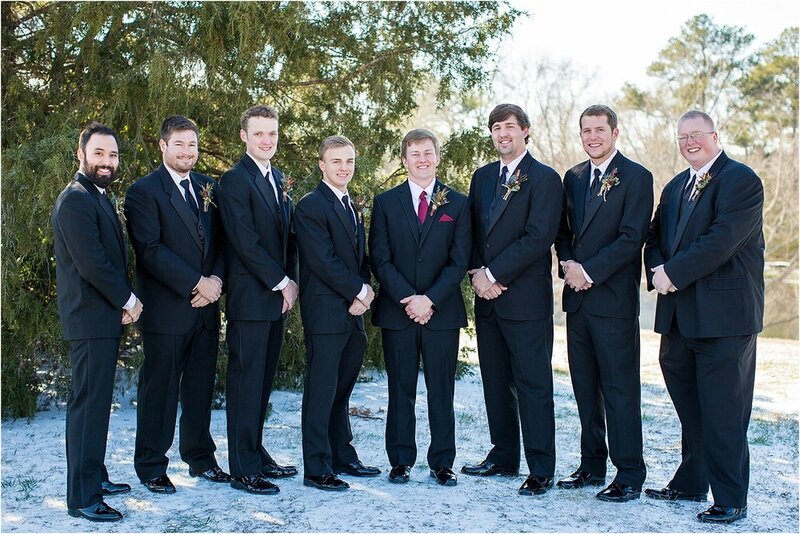 Meanwhile, Taylor was also getting ready with his groomsmen, just two doors down in the venue. The two of them chose not to see each other before the wedding, but just wait for the moment right before the ceremony. It. Was. Magical. 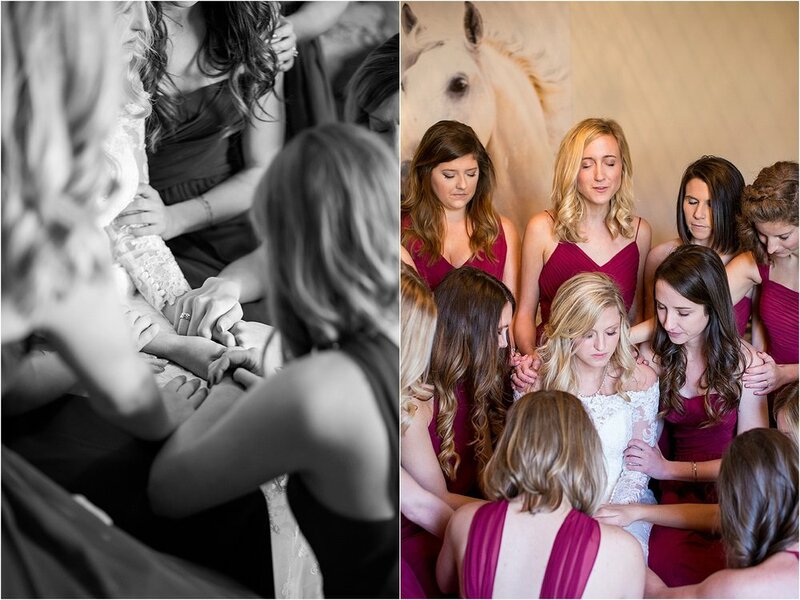 But now this below- THIS is why you should do a "Bridesmaid Reveal." How this works is the bride puts on her gown with her Mom and/or her MOH. 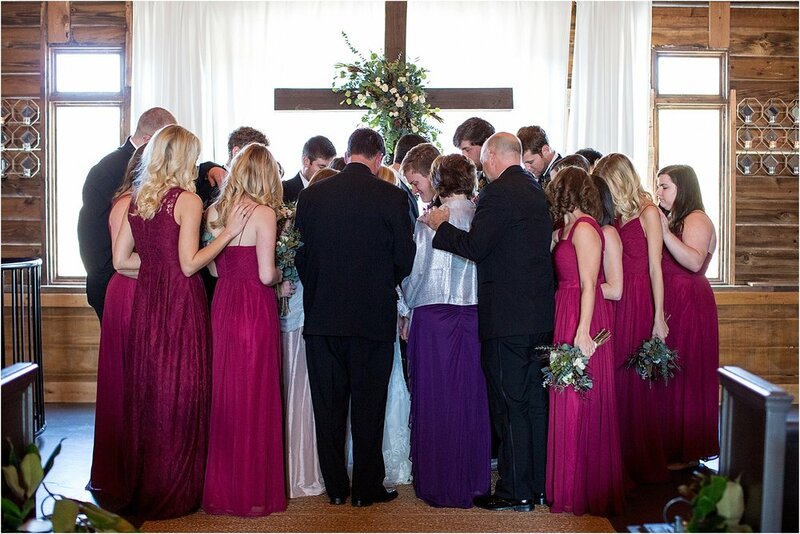 Then we line up the bridesmaids with their eyes closed and then we reveal the beautiful bride. 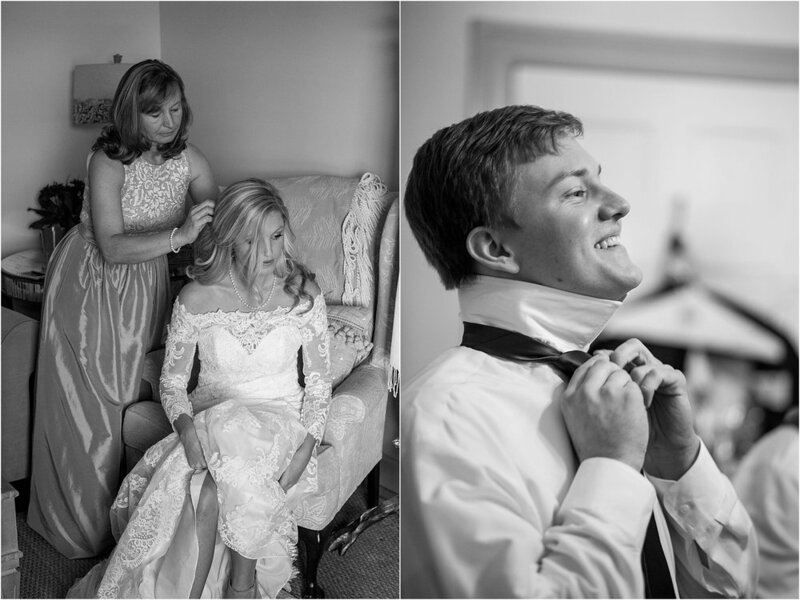 And here's another one of my favorite add-ins, a first look with the father of the bride. 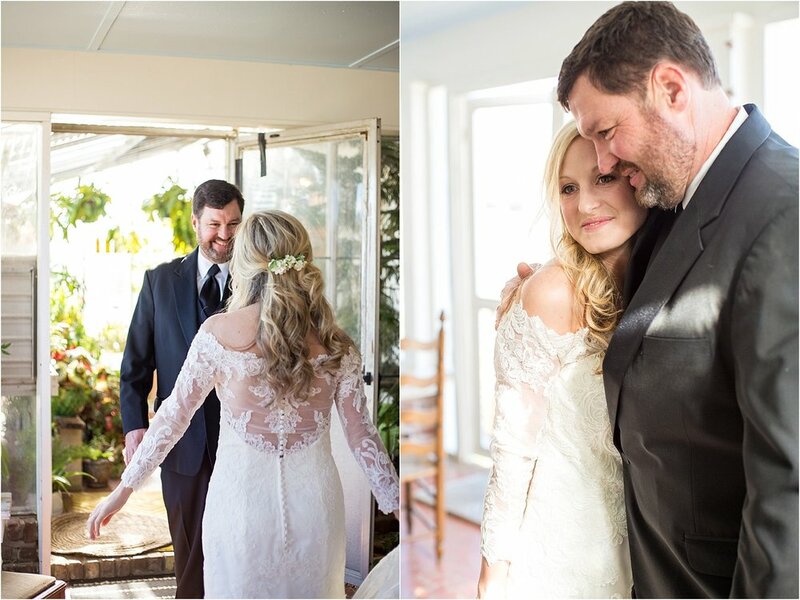 These are some of my favorite photos at weddings. Sweet Sydney snags a peek of her Daddy before she gets her big reveal with him. Then we hopped straight into Bridesmaids w/ the Bride, tucked the Bride away, then went into Groomsmen w/ the Groom. 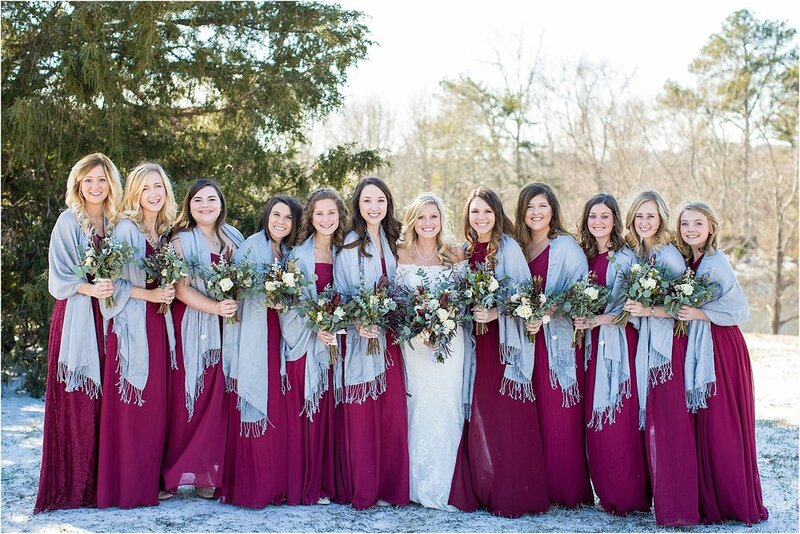 How gorgeous were these scarves with the bridesmaid dresses?! 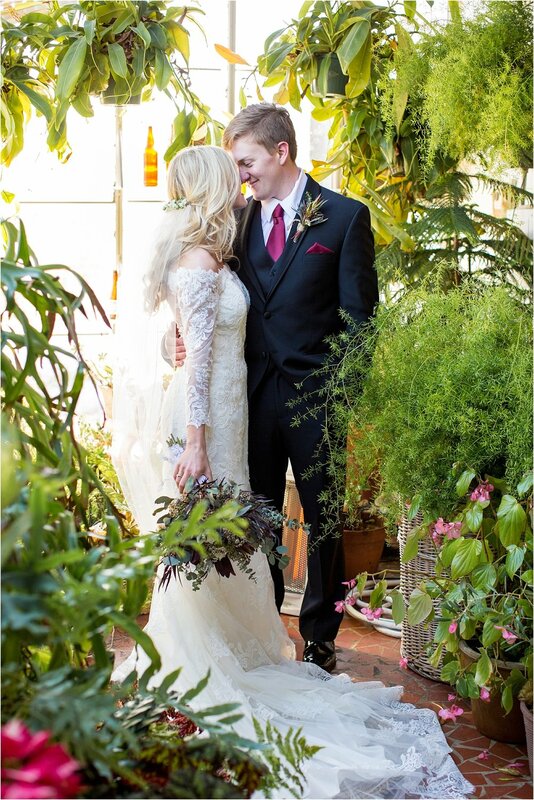 And those florals were simply dreamy. Right before we tucked Sydney away, she wanted to get a photo with her "Bubba." Okay y'all, here's one of my favorite moments. Remember, they didn't want to see each other before the wedding. 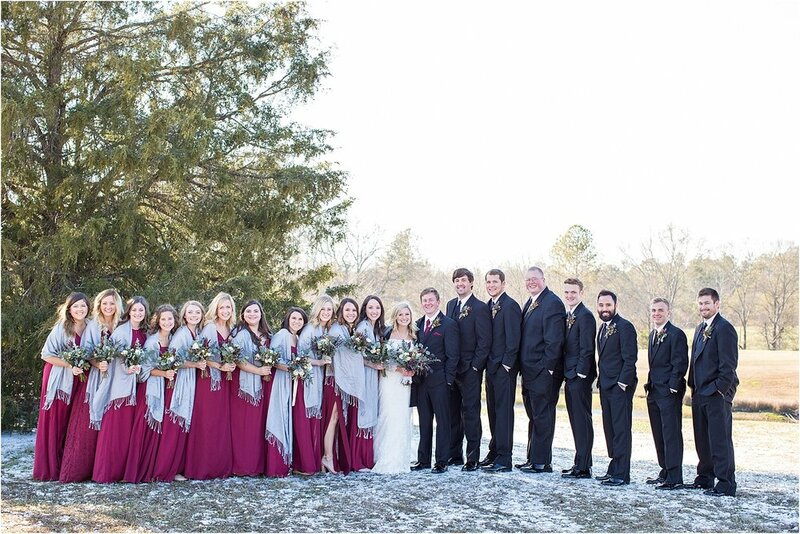 So we took a scarf from the bridesmaids to blindfold Taylor during their prayer together, but i'll be honest- the scarf looked a little silly, like he was kidnapped by the photographer (LOL). So I said, "Taylor, I know you're very trustworthy. Do you promise you won't peek at all? You'll squeeze your eyes shut as tight as you can?" He promised and asked, "But will her eyes be shut? Because I know she will walk in here and want to fix my hair just the way she likes it." And guess what she did first thing? He's good haha. So they had a sweet moment of prayer, then Sydney went back to her girls right before game time. 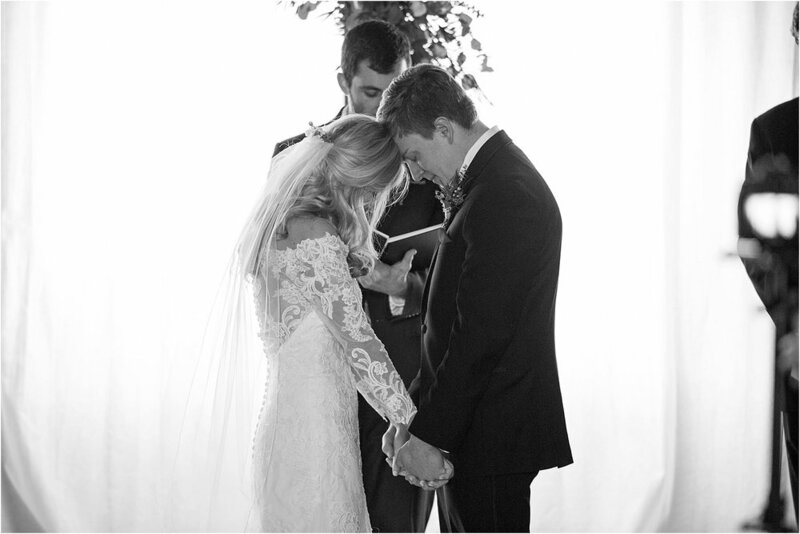 One of the sweetest ceremonies i've seen to date. I am so in love with their portraits. And the warmest place on the whole grounds? The greenhouse (all the heart eyes!) 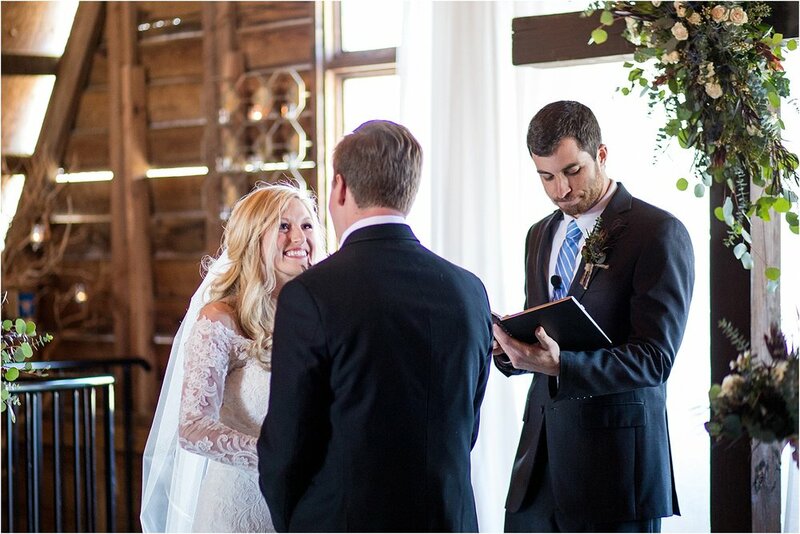 Sydney also stitched their wedding date on the back of his tie. P.S. My new favorite exit: a lavender toss. It smells SO good! 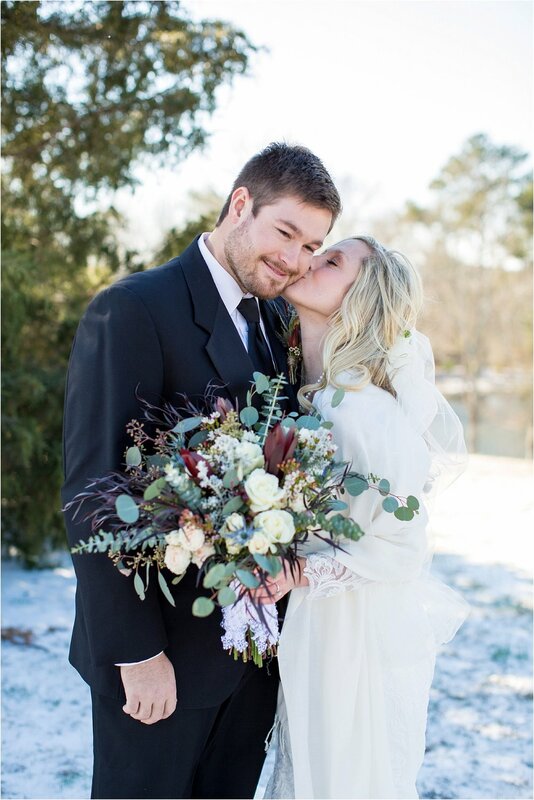 A special thanks to all the people that helped made their big day possible! A special shoutout to Kiley Carpenter from Southern Frame Photography for literally dropping everything last minute and braving the icey roads to second shoot with me! You are a trooper!